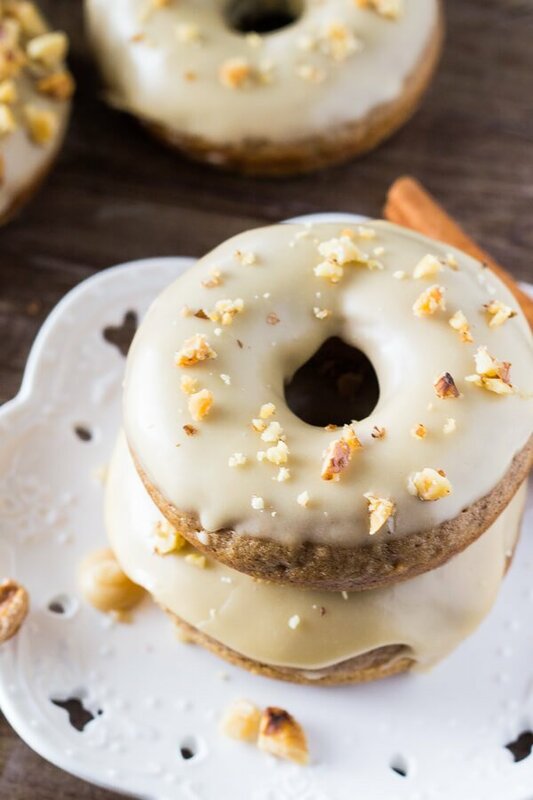 Delicious spice cake doughnuts dipped in sweet maple glaze and topped with crushed walnuts. These maple doughnuts taste like fall – and best of all, they’re baked instead of fried! There’s something so very comforting about doughnuts. They’re like the feeling of childhood and relaxing mornings with a large coffee all wrapped into one delicious baked good that’s dipped in glaze and sprinkled with love. Anyways… As the weather dips, the leaves turn orange, and sweater weather is upon us – I decided it was an ideal opportunity to make doughnuts. Maple Doughnuts in fact. Because baked goods + fall = love. 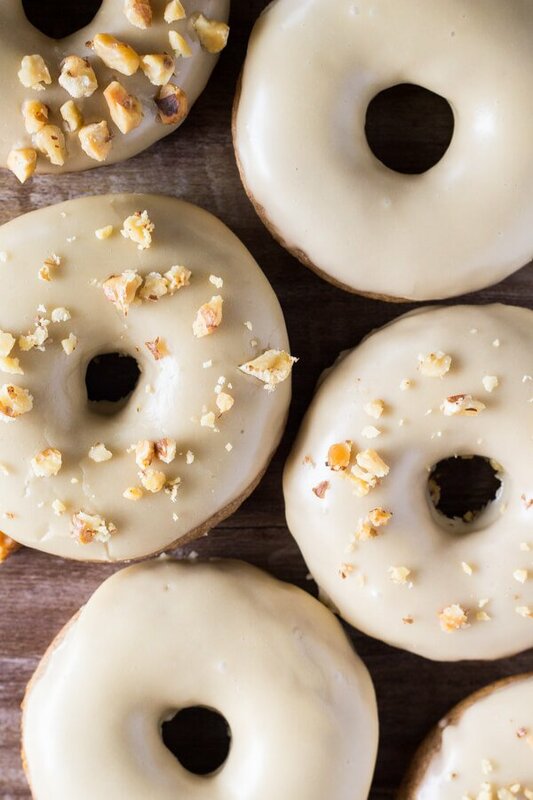 And these baked maple doughnuts taste like fall in doughnut form. 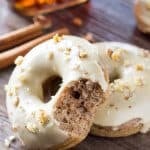 In this maple doughnuts recipe we’re making a delicious spice cake doughnut made with cinnamon, nutmeg & ground cloves. 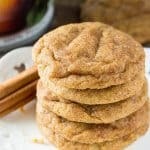 Then they’re full of brown sugar and vanilla for the most comforting, rustic, homey taste. 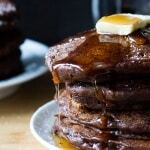 The batter also has a hint of maple syrup in it for extra deliciousness. Then there’s a secret/not so secret ingredient to what makes these cake doughnuts so tasty: We’re using brown butter!!! Brown butter is what happens when you melt butter in your saucepan while gently stirring, then leave it over the heat and continue gently stirring after it’s melted. It will crack, pop and bubble; then after a few extra minutes, you’ll notice little brown flecks start to form as it froths. It gives off a deliciously nutty aroma and the butter will look amber in color from the little brown flecks (these are milk solids). Below is a picture of our brown butter to give you an idea. (Note that while the recipe calls for 1/4 cup butter, we won’t be using all of it – the volume actually decreases as you brown the butter). Now – I like these spice cake doughnuts perfectly cakey, deliciously dense and perfectly moist – which means we’re using buttermilk and sour cream in the batter. Be careful not to over mix the dough, or else your doughnuts can get tough and hard in texture. After they’re baked in a doughnut pan – it’s time to make the maple glaze. 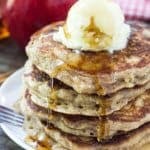 It’s made by whisking together butter, cream, brown sugar and maple syrup over low heat in a sauce pan – then whisking in some powdered sugar. You can add a little maple extract too if you’d like a more prominent maple flavor. The sweetness of the maple glaze paired with the comforting spices of the baked doughnut is such a perfect combination. Plus, there’s just something about cinnamon & maple that scream fall. 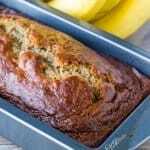 What’s on your fall baking to do list? 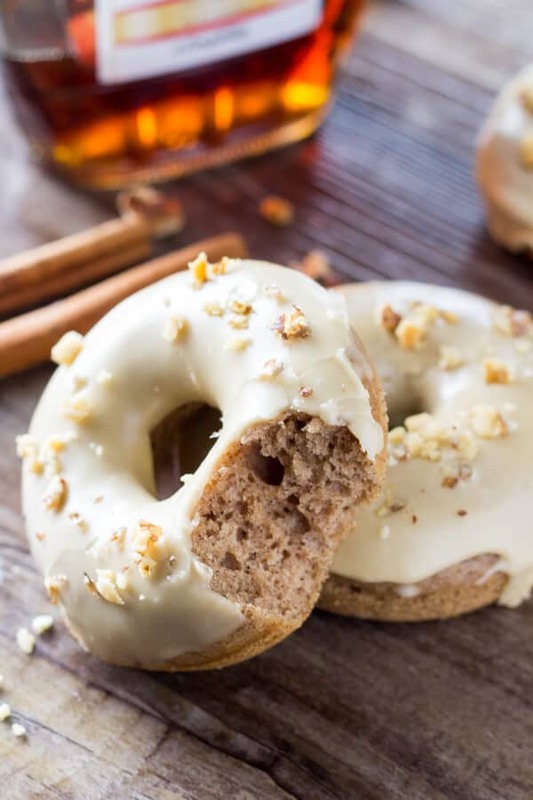 A delicious spice cake doughnut with sweet maple glaze and topped with crushed walnuts. It's like fall in maple doughnut form - and best of all, they're baked instead of fried! Preheat the oven to 350F degrees and spray a 6-cavity doughnut pan with non-stick cooking spray. You'll end up with about 6-8 doughnuts total, so you may need to make them in 2 batches or spray 2 doughnut pans (if you have multiple). In a large bowl whisk together the flour, cinnamon, nutmeg, cloves, baking soda and salt until combined (about 30 seconds). To brown the butter, melt the butter over medium heat in a small saucepan over the stove. Once the butter has melted begin whisking it gently until it starts to bubble and make popping noises. After a few minutes you'll notice small brown flecks begin to form and you'll smell an almost nutty aroma. Once the butter looks almost amber in color, remove it from the stove top and let cool. After browning the butter, it will be less than 1/4 cup in volume. Measure out 2 and 1/2 tablespoons of the brown butter (you can discard any excess). 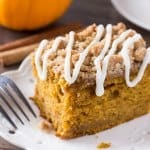 In a medium sized bowl, gently whisk together the 2 and 1/2 tablespoons of browned butter with the packed brown sugar, vanilla, and maple syrup. Then whisk in the egg, followed by the sour cream and buttermilk. Add the wet ingredients into the bowl with the flour mixture, and fold everything together using a large wooden spoon or rubber spatula until combined and no lumps remain. Be careful not to overmix the batter. Spoon the batter into the prepared doughnut pan. Alternatively, you can spoon the batter into a large ziploc bag, then cut off one of the bottom corners and pipe the batter into the doughnut pan. Fill each doughnut cavity about 1/2 to 2/3 full. You should end up with about 6-8 doughnuts total. Bake in the preheated oven for about 8-10 minutes or until the doughnut springs back slightly if you gently tough it with your fingers. Allow to cool in the pan for about 5 minutes before removing the doughnuts from their pan and cooling on a wire rack. As the doughnuts cool, make the glaze. In a small saucepan over medium-low heat melt together the butter, cream, brown sugar and maple syrup while whisking gently. 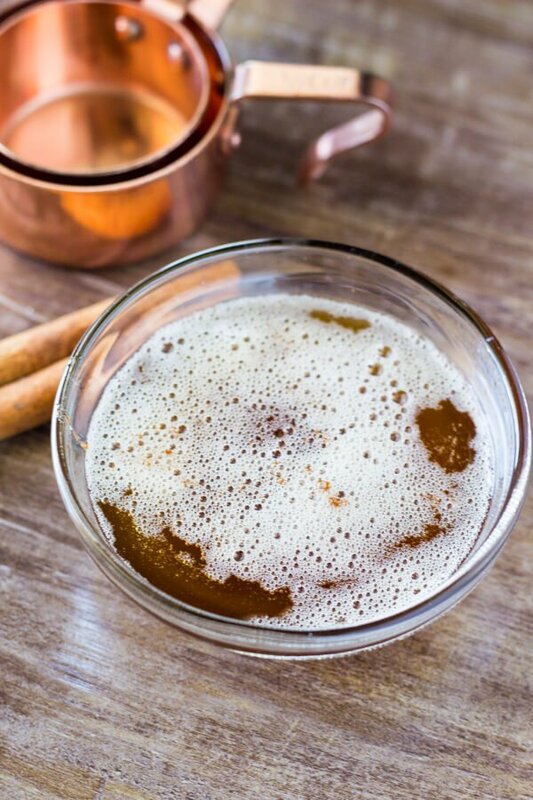 Once everything is melted and no lumps of brown sugar remain, remove the mixture from the heat and whisk in the vanilla, powdered sugar and optional maple extract. Dip the tops of the doughnuts in the glaze and place back on the wire rack for the glaze to set. Sprinkle with chopped walnuts. So good! I love baked donuts, and I’m totally getting in the fall spirit right now. Perfect timing. SO MUCH YES. These look like a pure, spicy taste of fall. Love it! I made these this morning and they are wonderful. They did only take about 1/2 an hour to make. We will enjoy these often! Thank you for this recipe and I’m going to try more of your recipes.